And it’s a stunning ascent. 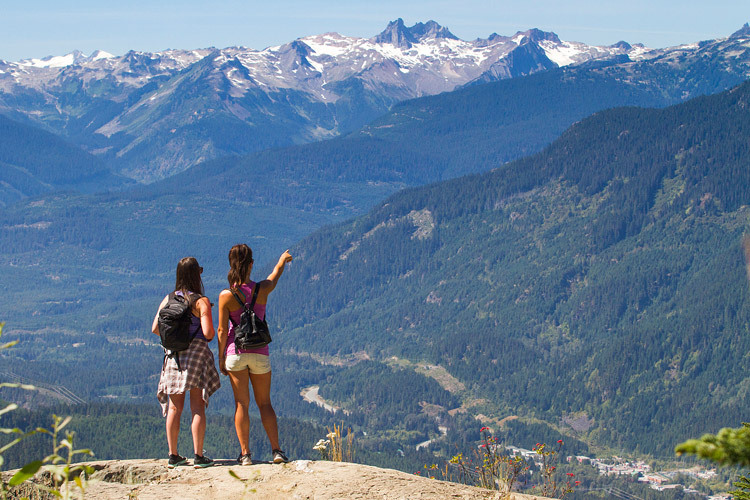 We climb over the trails of the Whistler Mountain Bike Park and through towering cedar and fir forests. And then we hit the snowline. Ace MacKay-Smith, my adventure companion and infamous Whistler ski bum, hasn’t seen snow since a knee injury in March. For a true mountain lover like Ace that’s a long time to be stuck in the valley. Two weeks out of surgery we figured a trip up top and a ride on the PEAK 2 PEAK Gondola would be just what the doctor ordered. There’s also enough snow for a mini tube park set up right beside the PEAK 2 PEAK main building. Ace partakes (her first snow sliding in months) and encourages some tentative tourists as well, although the six-year-old girl who’s never seen snow before doesn’t need much prodding. 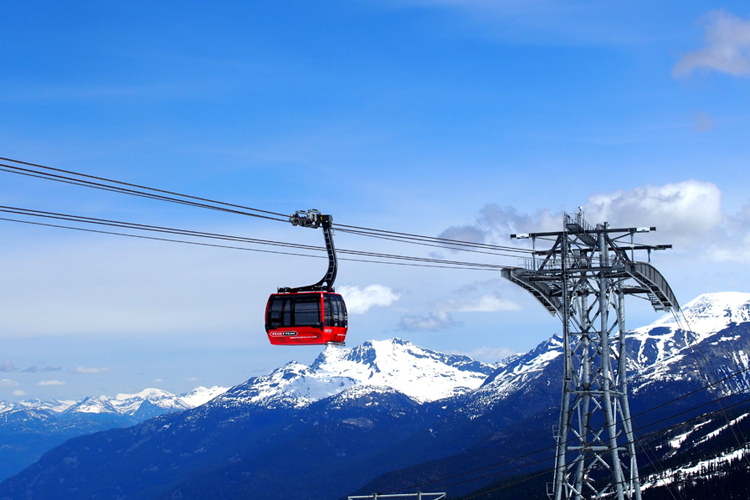 The PEAK 2 PEAK Gondola is Whistler’s greatest feat of engineering. It’s the longest unsupported span in the world (3.02 km/1.88 miles) and highest lift of its kind, dangling 436 metres/1,428 feet above Fitzsimmons Creek at the highest point. 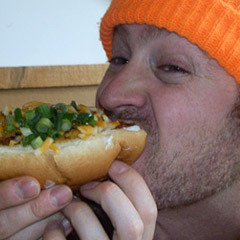 Most importantly for locals, it revolutionized the ski season. The PEAK 2 PEAK makes it easier to meet friends and shred pow on both mountains in the same day. To get from Whistler to Blackcomb used to take an hour of skiing and uploading. Now it’s a simple 11 minute ride, and a scenic one at that. It’s the scenery that steals the show in the summer but the accessibility is equally important. From non-skiers to the elderly to rehabbing adventurers like Ace, anyone can ride up to the PEAK 2 PEAK and enjoy a real mountain experience. The dizzying heights (wait for the glass-bottomed cabin) get the adrenaline going and the breathtaking views of Whistler and the Coast Mountains really show why we love it here so much (and on cloudy days there’s a really cool, albeit eerie, solitude that comes with dipping down into the thick silence of a bank of Pacific storm clouds). More mechanically inclined PEAK 2 PEAK-ers (like my dad or father-in-law) will be equally impressed by the sheer size and scope of the gondola project. The massive intermediate towers supporting the cables stand 30-65 feet high (100-210 feet) and combined weigh over 400 metric tons. The wire cables (four track ropes and one haul rope) add up to more than 80 metric tonnes and stretch a total of 26.5 km (87,000 feet). It’s big and burly and truly a world-class ride. Now anyone can learn all about it and get good look at the machinery driving the whole operation. 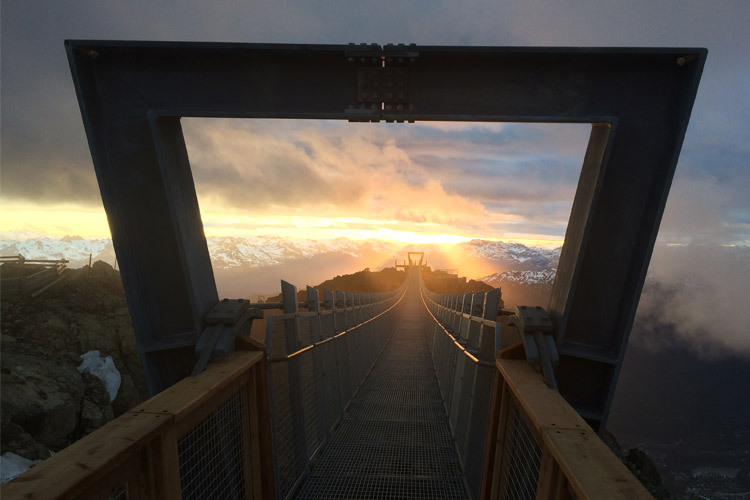 The Whistler Mountain PEAK 2 PEAK terminal features a new viewing gallery for summer 2013. A raised walkway gives inquisitive minds a good overhead look at some of the engineering behind one of Whistlers most visited attractions. Bull wheels and drive shafts, conveyors and decelerators – it’s a gearhead’s dream up there. Plus there are handy facts and trivia printed on the glass and stationary tablets featuring videos on the construction of all aspects of the gondola as well as general Whistler ski history (bring your own headphones for the best audio experience). After a round trip on the gondola I catch Ace staring up at the Saddle, a popular Whistler ski run, where a tiny group of hikers are climbing the snow. “Do you think they’re gonna ski back down?” she asks. You can hear the jealousy in her voice, a ski bum deprived, but also there is joy – just seeing people on snow makes Ace happy. 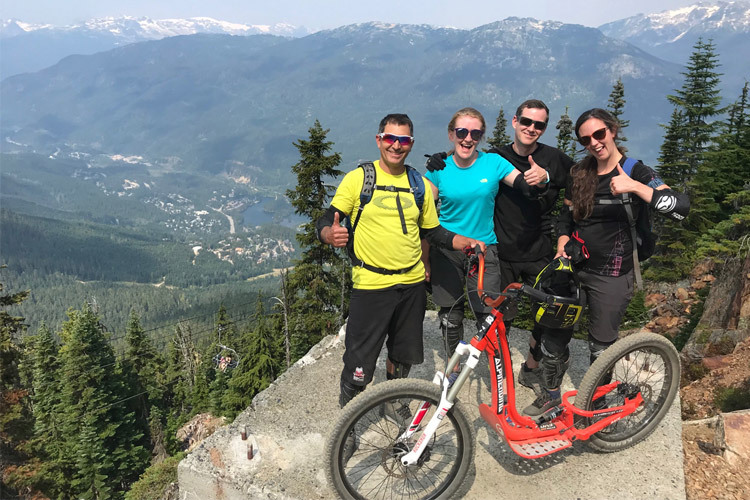 You can’t keep a ski bum down for long in Whistler, not with the world’s highest gondola and “Ascent Coordinators” like Doug to make sure we’re smiling before we even get to the top. The PEAK 2 PEAK Gondola closes for scheduled maintenance at regular intervals, so check the dates and times as you plan your trip to avoid disappointment.